I installed the current nighty build on bot my MacBook Pro and my Mac Pro. I open a mkv movie file. I switch to the preset "H.265 MKV 1080p30"
Then I want to select the VideoToolbox encoder option. On the MBP is is available and it works. On the MacPro the option is not available from the "Encoder" menu. Can you please tell me why I cannot use the VideoToolbox encoding option on my MacPro? Because there is no QuickSync on Xeon cpus, and I don't remember if there is a hardware encoder on the D500, but clearly it's not supported by Apple. With such Mac you will have much better quality and speed by using a software encoder like x264 and x265. @Ritsuka, videotoolbox is useful for more than just QSV on Macs. Sorry, but as there's no "activity" problem I did not post an activity log. My question addresses the availabilty of a feature on certain system configurations. In this case, you supplied enough information that someone was able to answer your question (specifically CPU type). Most people don't. The log tells us CPU type and other things, like whether an error occurred at start-up. If your problem had been some sort of error, we would still be scratching our heads over this due to insufficient information from the missing log. This information is in the log even if you haven't performed an encode yet. Users are not known of their ability to report on what version of HB they have, where they got it from, what hardware they're on, what settings they selected, or various aspects of their source video accurately. Since the availability of some features depends on those, an activity log is a great idea. If any further encoding questions rise I will of course post the log. In this case I saw in the log that there is no additional information about the system, other than I described manually. Thank you you for the answers! I have an additional question: You say on such a MacPro I such get better speed and quality using software enoding. 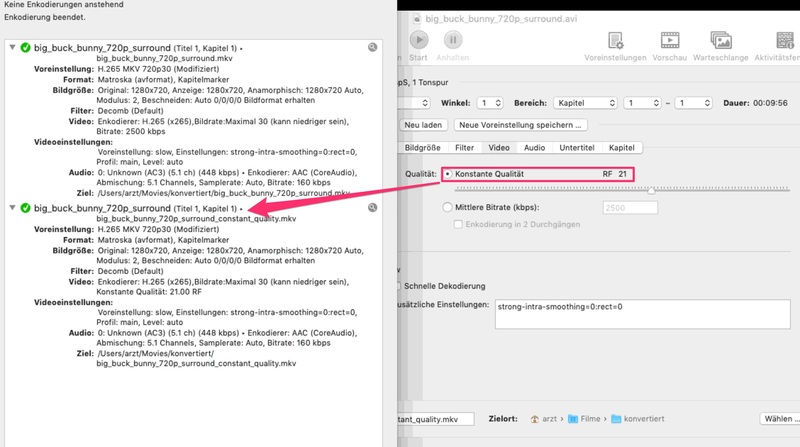 However, If I use comparable settings for the x265 encoder (just without VideoToolBox) the MacPro needs 6-7h to encode (appr. 6FPS), whereas the MBP encodes with VideoToolBox in appr. 1h (35-40FPS). So maybe there is a hint how to speed up software x265 encoding? Pick a faster encoder preset. And post your encoding logs from both so we can point out any other differences. Also decomb filtering is unnecessary with 720p source material, so you can disable that for a little speed. Also your "quality 21" encode is not, it's a 2500kbps target. Classic example of why logs are more useful than user claims. Or is that setting just not applied correctly? That's not the encode that log is for. The job with the out file name ending with "constant quality" was _definility_ configured to VBR with Q=21. I re-opened the finished job from the queue und I can confirm this setting. However, I agree that the 2 logs of the MacPro jobs seem to be "flipped" regarding the encoder settings. I am confused about this, too. Maybe a bug? I only did those 2 encodings of that file, there are only those 2 log files in the log folder. However, I want to point to the main question again: Why is a constant bitrate encoding _much_ faster on the MacBook Pro just because using the VTB option? Is that possible? I always thought the MacPro is a high speed machine, now it is way slower than the GPU of a mobile device?? Are there other "hidden" differences in the encoder options that can explain it? Set x265 to a faster preset until it's as fast as the hardware encoder in your other Mac. The hardware encoder is a completely different encoder implemented as an asic in the CPU, it's no just "another" option. You picked a slow setting on a high efficiency software encoder and are comparing to a low efficiency hardware encoder. It's completely apples and oranges. thank you again for the answers. To me it seems there's no difference, the file size also is quite the same. So in my eyes it makes no sense waiting hours more for the MacPro to finish encoding a video when the MacBookPro does the same job much faster. 1) Stills is not a terribly useful way to compare video encodes. 2) Those aren't even the same frame. 3) There's a non-trivial chance your current bitrate/quality target is higher than you actually care about, and you could have the same result with an even smaller file size by adjusting appropriately. Of cause I compared the playing videos side by side. The stills are only a sample documentation to illustrate my impression of quality. I thought this might be helpful to other users. I know the frames are not perfectly the same, however in this scene 95% of the image does not move, just the butterfly. I did not find out a way to jump to a specific frame in VLC - can you tell how to do this? How would you compare video quality? Is there a way to "measure" artefacts? I'm not aware of any way to jump to a specific frame in VLC. I'd compared video quality by watching the videos, side by side or back to back. You can measure video quality in a variety of objective ways, but none of them really take a psychovisual model into account. So, when the new HandBrakeCLI came out (handbrake 1.2.2), I started using the vt_h265 hardware compression. I didn’t notice at first but then later found all the compressed videos very pixellated and not viewable except at like tiny screens. So then I did some comparisons between the hardware compression (-e vt_h265) and the default software compression (-e x265). Here’s what I found. Not sure why but with the vt_h265 option, the file is smaller AND very very very (read not watchable) pixellated. At first, I thought this was the source video. However, I’ve done several (3-4) tests now with different inputs (mkv, mp4, avi, etc. ), all seem to be pixellated in the end after hardware compression. The compression runs about the same speed for software and hardware options. However, running several HandBrakeCLI commands at the same time with software and with hardware options - software is MUCH faster and more scalable. So my input to the HandBrake team is why is the vt_h265 hardware option producing pixellated outputs that are supposed to be the same resolution as the source while the software compression works fine? Last edited by rollin_eng on Wed Mar 27, 2019 8:31 am, edited 1 time in total. VideoToolbox doesn't support constant quality mode. You have to set a bitrate. I guess the cli lets select constant quality, and then set a random bitrate or whatever. The efficiency of the hardware encoders is crap. You're going to need larger files to hit the same quality as x265 produces.